have a 2018 Kona Process 153 that I built from the ground up. The bike is in amazing condition with very low miles on it. Built it up over the summer and with work/school haven't been able to ride it much since. The frame has no scratches at all, the fork is in amazing condition, as well as all the parts on the bike. This bike is easily one of my favorite bikes I've owned. It pedals better than I expected with little to no pedal bob while climbing, while also being one of the best descending long travel 29ers I have ridden. 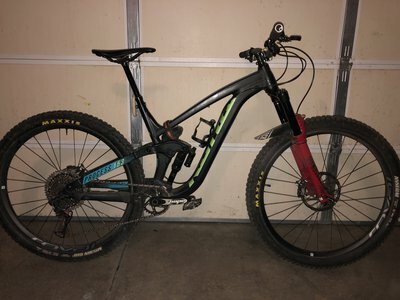 If you're looking for a do it all bike that can smash downhill runs or go out for a chill trail ride, this bike is for you. Buyer pays for shipping. If you have any questions about the bike or build, feel free to message me. Message me if you would like more in detail photos! Does not come with Roval wheels or X01 cassette. Tires: Your choice from what I have.